"The knights of the golden circle was a secret society started by George Bickley. Bickley was from Cincinnati. He was a master at lying and he set out to convince others, that his secret society, with the help of the southern Border States could conquer Mexico, Central America and Cuba. This “circle” of countries would represent the “golden circle” of the KGC, the knights of the golden circle. Included within the “circle” were individuals from some of the Northern States who sympathized with the south and their belief in slavery. The KGC wanted to use those northern influences, and along with the southern states, extend slavery into the “golden circle” countries, thus enhancing slavery in the southern states. Bickley gained the support of some Southerners. In 1860 members of the knights of the golden circle were paying dues. Their intent was to use the money to purchase arms to support their efforts. High-ranking officials from the states of Indiana, Ohio and Illinois supported the confederacies idea of perpetuating slavery. These sympathizer states ran secret cells, or castles where they held meetings. It’s been rumored that by the time the civil war broke out, the KGC had stashed millions of dollars of currency and gold to fight a secret war against the northern army, all with the intention of helping the south to win the war and keep slavery in existence. The KGC had different levels of what they called “degrees”. These degrees were called “Neophyte and “Vestibule” degrees. Each member of these degrees were bound by the obedience of the Officers of each degree, and the secrecy of the respective orders, or else. Or else they would end up dead. Family members of any KGC initiate who broke this vow of silence were also murdered. There were instances where KGC members were killed, their homes burned and their families murdered. Members of the Neophyte and the Vestibule degrees would greet each other with secret signs. These signs were used as both a means to test and to recognize members. In public for instance, when two members needed to meet in secrecy, whether to talk about a KGC event or plan of action there was a specific way to approach each other. Standing erect, the heel of the right foot would be placed in the hollow of the left. The right hand would be placed under the left arm. The left hand would be brought under the right arm. With the arms now folded, the four fingers of the left hand would be placed over the right arm. The person being addressed would then mirror the exact posture. Both individuals would now be in complete confidence of the other, and they would then move to an area for talking. The knights of the golden circle buried secret caches of weapons, coins, and gold and silver bullion. Much of this hoard was stolen from robberies of banks, trains carrying payroll of the northern army during the civil war and from northern army military posts. Many of the treasures were buried in the southern and western states. However, reports of small caches have been reported in some of the northern states as well as Canada. The knights of the golden circle were like many secret societies. This means there is not much information about their activities. And regarding their buried treasures, there is not much written or documented information about where the Knights of the Golden Circle buried their caches. However, the KGC did leave strange symbols and codes on rocks and trees as guides to where these treasures are located. Many of the signs have been seen in States across the U.S, and Canada. I have seen some of these symbols. I have also dug relics with KGC symbols detailed on them. As the years go by, more and more information regarding this organization will begin to surface. Many KGC researchers believe that the outlaw Jesse James was a member of the KGC. If he was a member, then much of the money he had stolen during his outlaw days was for the purpose of funding the KGC movement in the Southern states. The life of Jesse James has been controversial. Books written about him have different varied opinions. Even some of the Hollywood movies have portrayed JJ more of a fictional character than what he really was. Many questions such as, what was his real name? When did he die? And, where was he buried are, lead researchers to believe that these questions are enough to point to his membership in the knights of the golden circle. 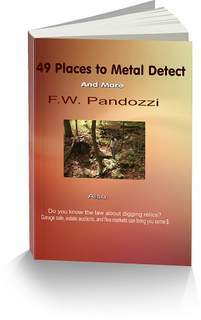 This is a facinating book that tells a true life story of a man’s quest to locate buried treasures hidden by Jessie James and the secret society, the KGC. John Wilkes Booth the man who murdered President Lincoln was a KGC member as well as a Freemason. After the assassination, a trunk owned by Booth was located. In the trunk were coded messages and symbols that were used by the knights of the golden circle. The messages have been de-coded by modern researchers and they tell us that these strange symbols tied Booth to the murder of President Lincoln. The Knights of the Golden Circle left signs and symbols in remote areas.